The Red Nexus 5 began as a rumor, but things started to appear concrete when our eyes landed on a pic of Sprint's internal documentation informing workers that the device was going to land on Google Play February 4th. Now @evleaks has shared what looks like a pretty believable press shot. The imminent release of a red Nexus 5 still isn't guaranteed, but @evleaks has a good track record with these things. 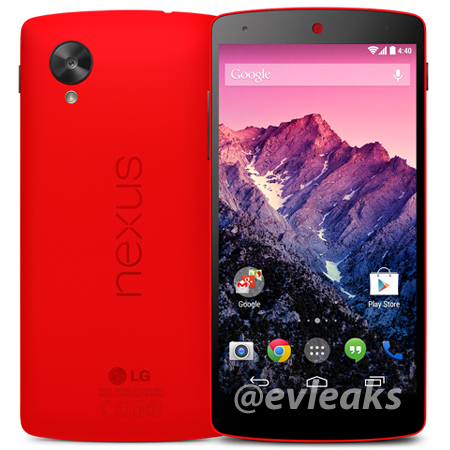 If this is what a red version will ultimately look like, it will represent another variation in the Nexus 5's color pattern. The "Panda" option only has a white back, whereas this red version has color that wraps around. Both have colored earpieces. So if you love red, you may soon be able to pick up a Nexus 5 in that color without having to invest in a bumper case to go with it. And this could be coming to us just in time for Valentine's Day. How sweet.